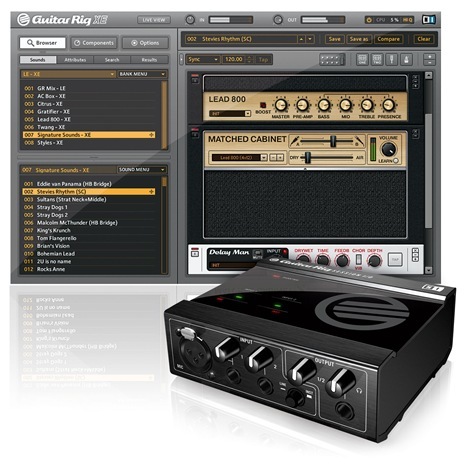 Guitar Rig 3 XE is a "lite" version of Guitar Rig, focused on the basics — 5 guitar/bass amps, 12 cabinets, and 21 effects. It also some of the "helper" modules from Guitar Rig, including a metronome, tapedeck, and tuner — but no looping module, which is one of my favorites. (See the full list.) US$99 on its own. Guitar Session bundles the XE software with Cubase 4 LE, some pop drums for KORE player via a soundpack, and the Session I/O audio hardware. US$250 for the bundle, available June 1 worldwide. In fact, there’s nothing that means you have to be a guitarist to get this bundle. Guitar Rig sounds very nice as a general-purpose effects suite; I’ve used it on everything from drums to sitar, and it’s especially nice on keyboards. And the audio interface comes at a nice price. If you can afford spending more, though, it could be worth it. Guitarists (and others, too) will likely miss Guitar Rig’s foot pedal control, and the tape loop module is one of the gems of the suite. Also, NI’s Audio 8 DJ and Audio Kontrol 1 each have assignable headphone outs for monitoring a separate headphone mix. But for what you pay, this is a pretty good deal for someone. It’ll just have to stand up to competing budget solutions from Line6 and IK Multimedia — there’s some really intense competition in this market.